TestPattern.org: So, if you are raising money for a Foundation is it still corruption? So, if you are raising money for a Foundation is it still corruption? An interesting article in the NY Times on Bill Clinton's efforts on behalf of a mining deal, and the resultant donation. There are some real gems within this piece, but aside from the 'way the world works' time line of the article, there are a few lesser details that I find interesting. A spokesman for Mr. Clinton said the former president knew that Mr. Giustra had mining interests in Kazakhstan but was unaware of "any particular efforts" and did nothing to help. Mr. Giustra said he was there as an "observer only" and there was "no discussion" of the deal with Mr. Nazarbayev or Mr. Clinton. But Moukhtar Dzhakishev, president of Kazatomprom, said in an interview that Mr. Giustra did discuss it, directly with the Kazakh president, and that his friendship with Mr. Clinton "of course made an impression." Mr. Dzhakishev added that Kazatomprom chose to form a partnership with Mr. Giustra's company based solely on the merits of its offer. 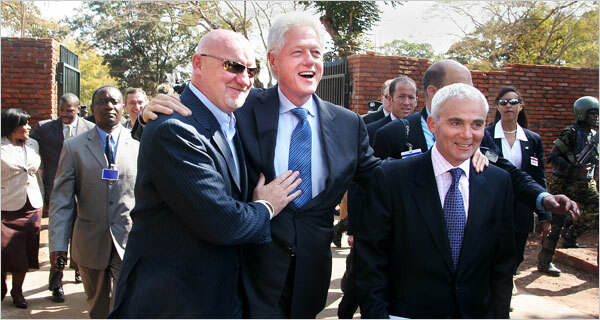 Both Mr. Clinton and Mr. Giustra at first denied that any such meeting occurred. Mr. Giustra also denied ever arranging for Kazakh officials to meet with Mr. Clinton. Wednesday, after The Times told them that others said a meeting, in Mr. Clinton's home, had in fact taken place, both men acknowledged it. So over and above the transparent whoring of his status as a former president, we get the continuation of a pattern of bold faced and easily disproved lies. Just think of all the glory that awaits us with yet another opportunist Bill who is related to the president.